I was pretty well caught up at work, and the weather forecast for Thursday was high of around 72 degrees for Canon City. It was supposed to turn cooler for the weekend, so I decided to make another trip to the Arkansas River. Royal Gorge Angler reported caddis hatching in Canon City, so I felt there was a remote chance that I’d catch the hatch between Parkdale and Texas Creek, but if not, I knew from the previous trip that the flows were ideal, and I could probably have some luck working the water with nymphs. I packed the night before and left the house at 6:40. It looked like rain in Denver, and I encountered dense fog as I drove south between Castle Rock and Monument. But the fog cleared and the sun broke through just north of Colorado Springs. I arrived at my chosen destination at around 9:15 and was on the river by 9:30AM. I parked in a small pullout .5 mile downstream from the Spike Buck access area. 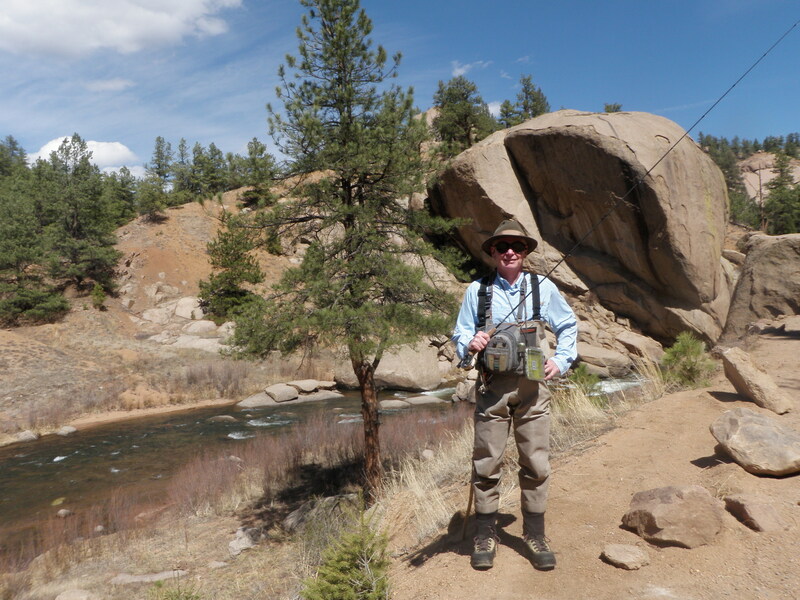 I began fishing with a royal stimulator trailing an emerald caddis pupa. I wasn’t getting any action on the stimulator, but twice as I worked along the left bank, I experienced momentary hookups as I lifted the flies to make another cast. I was having great difficulty following the stimulator as it was too small to support the beadhead pupa, so I switched the top fly to a bright yellow Charlie Boy hopper. This was much more visible, and I landed three brown trout on the emerald caddis pupa before breaking for lunch at 11:30. After lunch it was partly cloudy, and it seemed that every time the sky clouded over, the wind would pick up. I removed a layer, and overall it was quite pleasant for fishing. The water I was fishing was mostly nice pockets, and small runs within 15 feet of the bank. When I reached one point where there was a deeper run, I tried the strike indicator nymphing technique with a prince nymph and emerald caddis pupa, but this didn’t produce and I lost two sets of flies. I switched back to the yellow Charlie Boy with an emerald caddis and a beadhead RS2 below that. 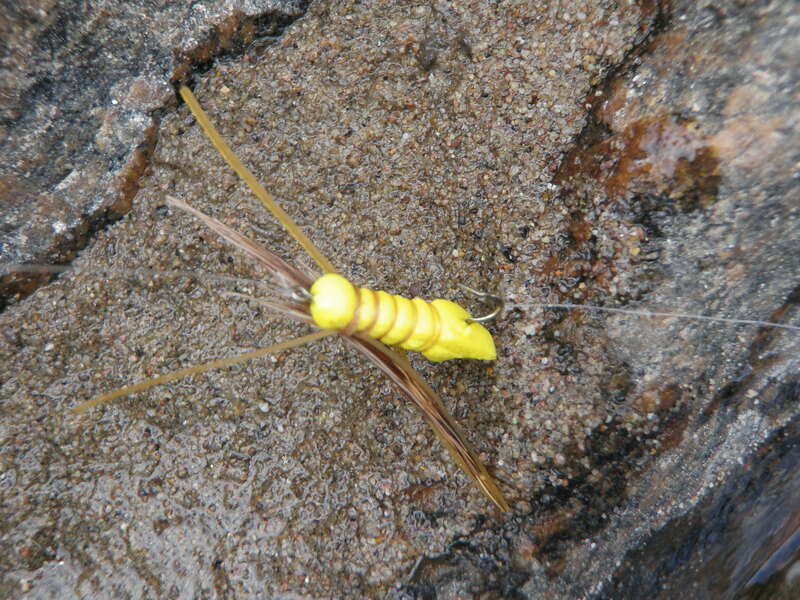 I spotted caddis dancing on the water very sporadically as well as an occasional BWO. I was landing fish at a fairly regular pace. It wasn’t fast and furious, but enough to hold my interest. I was moving from pocket to pocket at a fairly rapid pace and making a lot of casts. At one point the Charlie Boy hopper lost its entire wing, so I was fishing with a yellow foam strike indicator with legs. I clipped it off and replaced with a Chernobyl ant but retained the emerald caddis and RS2. I caught one trout on the Chernobyl ant. Toward the very end of the day, the number of caddis skittering on the water became more abundant, so I clipped off the Chernobyl and droppers and tied on a gray body caddis. I caught my last two trout on the caddis dry. 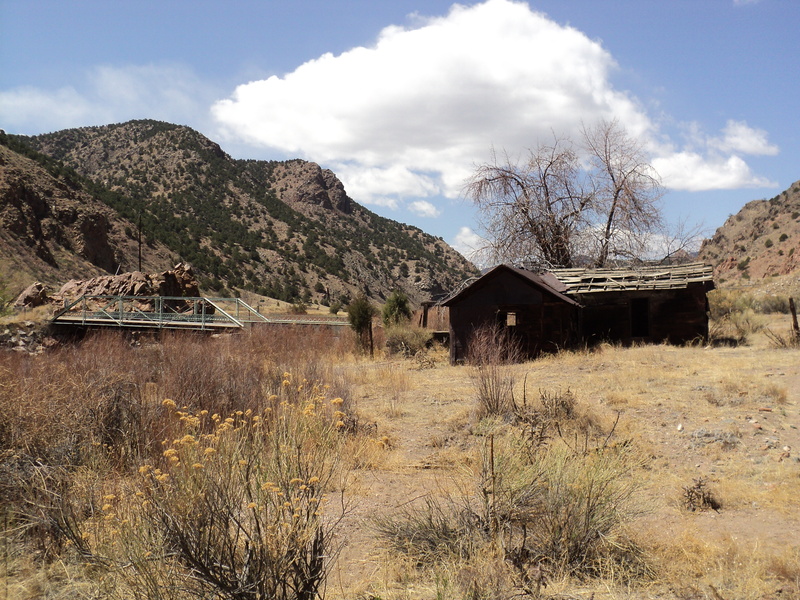 Jane agreed to travel along to the Arkansas River above Canon City and Royal Gorge on Saturday, April 16, 2011. We packed lunches, loaded the Santa Fe and got off to a nice early start. We stopped at Royal Gorge Anglers and I bought some tippet and leader and spoke briefly with Taylor Edrington, the agent I used for my Alaska trip. Taylor showed me a Beulah 5 weight rod and recommends that I purchase a similar 6 weight for Alaska. I told Taylor I’d be back on another trip to discuss a rod, reel and line purchase. When we descended the hill to the river at Parkdale, I could see that the flows were at a nice low level and clear. 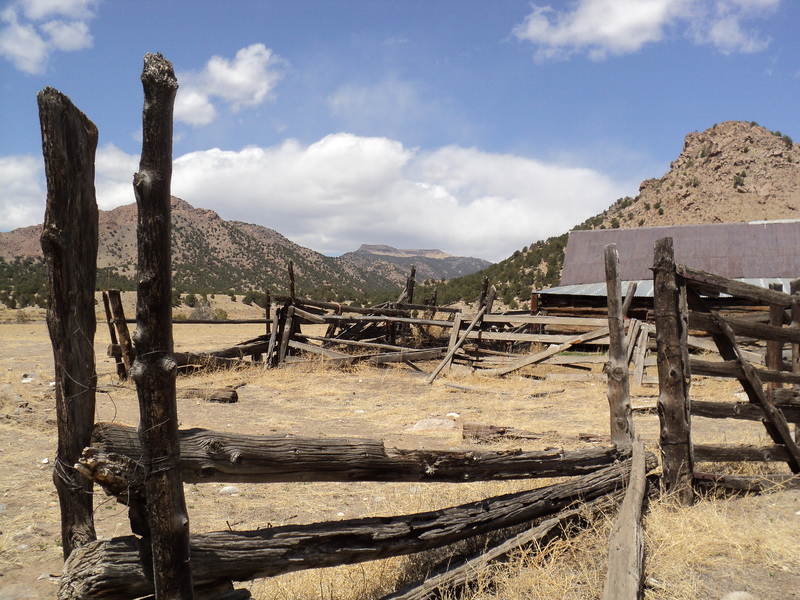 We drove along Big Horn Sheep Canyon to a pullout across from the multiple braids above Pinnacle Rock. I noticed the northern most channel was vacant, so I left Jane with the car, and waded across two channels below a pair of fishermen and headed for the north braid. One of the two fisherman fishing the nice run and pool along the highway, apparently saw me heading for the north braid, and made a dash toward that area as well. The fisherman would later become known as nemesis. I began fishing at the bottom of the braid where it meets the main stem of the river with a tan Charlie Boy Hopper trailing a beadhead hares ear. 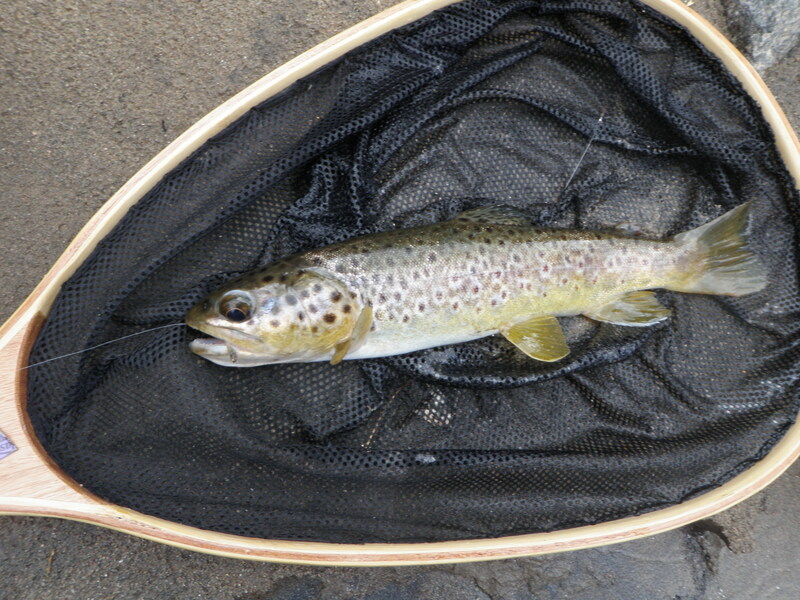 In short order I landed a small brown on the Charlie Boy hopper and then another small brown on the BHHE. As I worked upstream over some attractive water, the response to my flies ended so I switched the BHHE out for an emerald caddis pupa. Eventually when this also failed to produce, I switched to a nymphing set up with a strike indicator, split shot and beadhead prince on top with the emerald caddis pupa on the point. 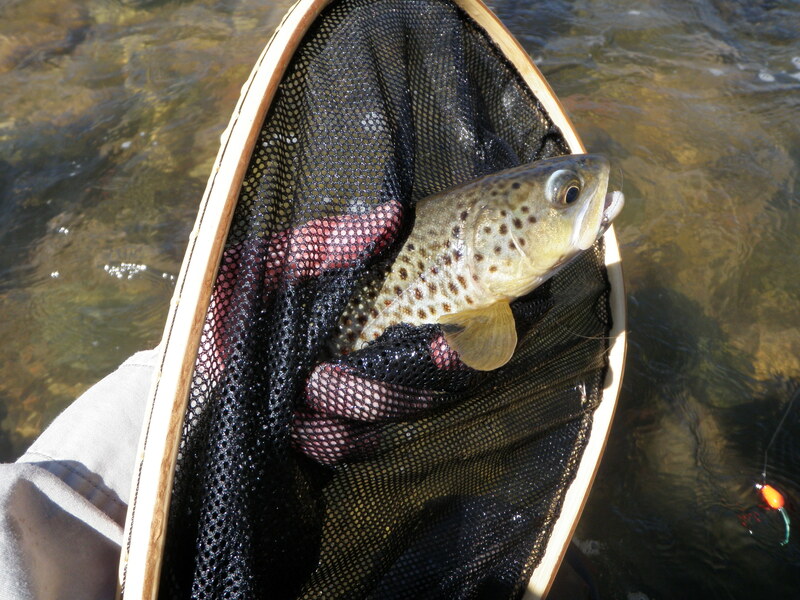 In an area with nice moderate depth of 3-4 feet and many subsurface rocks I landed two browns on the emerald caddis. At this point I was restricted from moving further upstream as nemesis was standing in a nice long pool spraying casts in 180 degrees. I retreated back to the main river above the confluence with the north channel. In this stretch I landed a brown on the prince nymph and had another hooked that escaped. I hustled back to the pullout to meet Jane as we’d agreed to meet at noon. 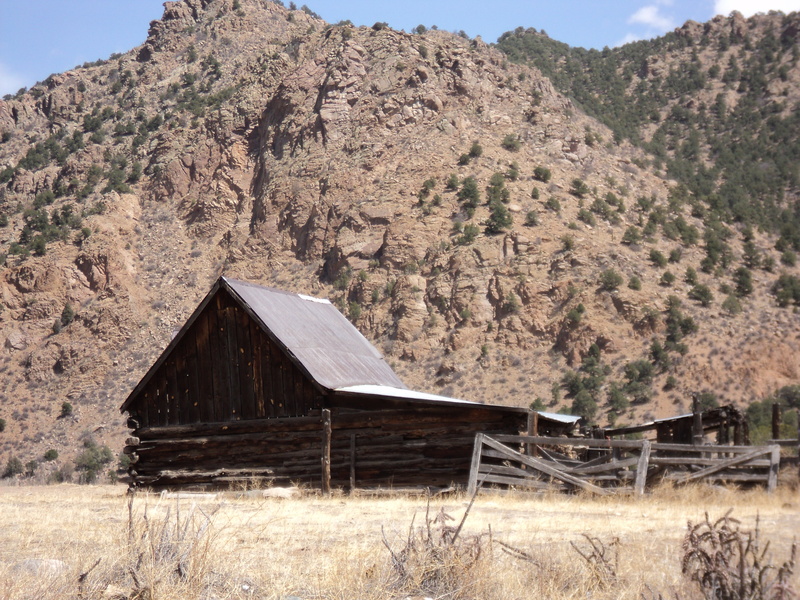 Jane had driven down route 50 to a nearby river access point to get off the highway more and find some sunshine away from the canyon walls. We decided to drive west to Texas Creek and crossed the bridge and parked in the fisherman parking lot and ate our lunches shielded from the wind by the car. After lunch Jane hiked along the fisherman path with me beyond the abandoned ranch to a point where I dropped down the bank to the tail of an island. I love the deep run below the island but two fishermen were already there. They must have arrived while we parked and ate lunch since they weren’t there when we drove by on the highway. Guess who was now fishing the delicious run below the island? Nemesis was back. 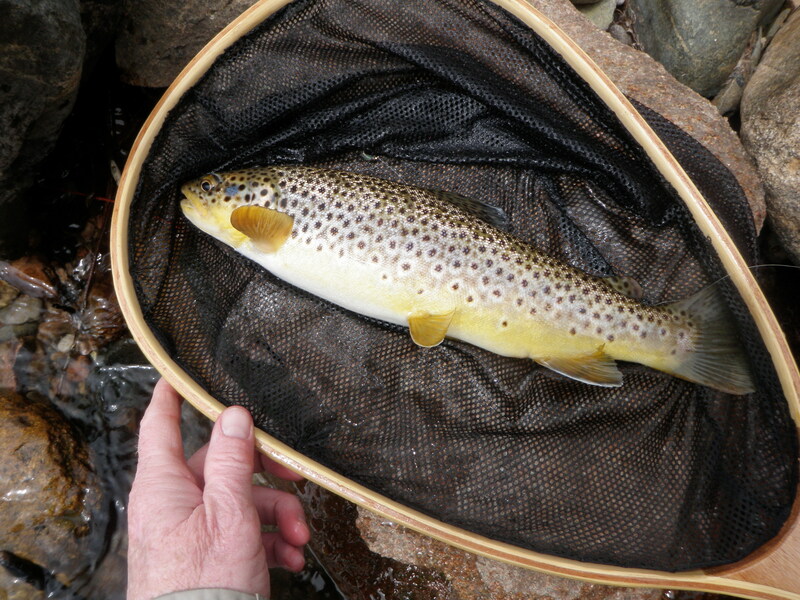 I ignored the irritation and fished up the north side of the island and landed two browns; one on the prince and one on the emerald caddis. When I reached the top of the island, I dropped down 1/3 of the way along the south side of the island and fished back up to the top. Jane had set up her chair along the shore at the top of the island sheltered from the wind and snapped a few photos of me. I continued along the right bank facing up the river and switched to a Chernobyl ant with the emerald caddis as a dropper. 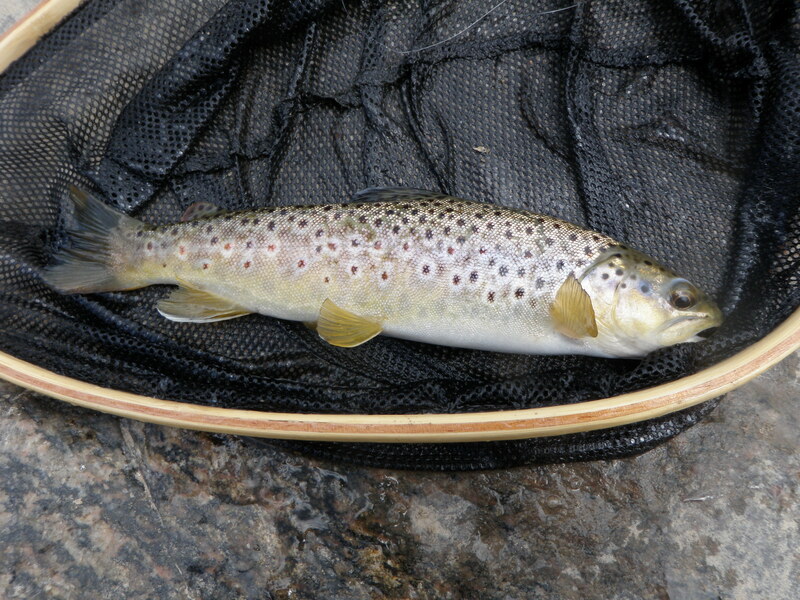 I landed one more trout on the emerald caddis between the island and the bridge. It was quite windy the entire time, and was a relief to quit and get out of the constant blow. 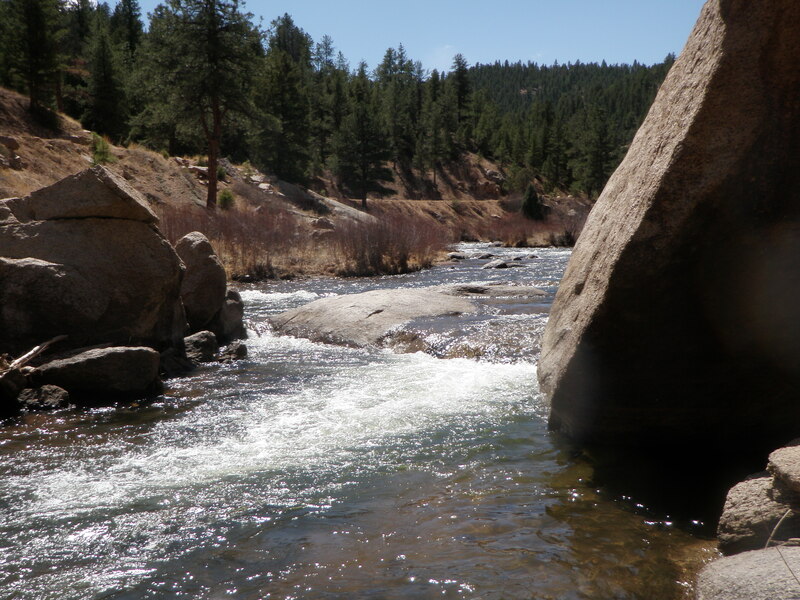 With weather reasonably nice on Saturday, but forecast to be cool and possibly damp on Sunday, Jane and I packed the Sante Fe and headed off to the South Platte River. Taxes could wait until Sunday when the weather wasn’t as nice. 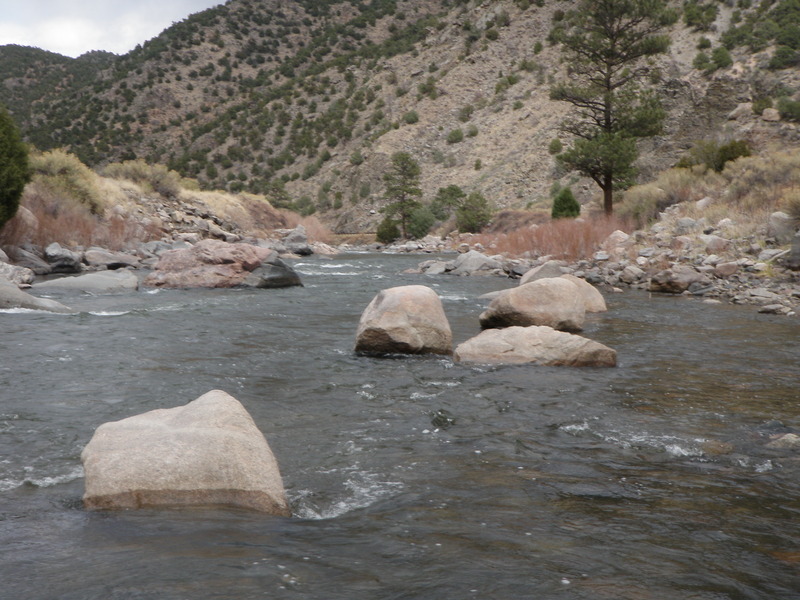 We arrived at the parking lot below Whale Rock at around 11:15, and I was on the river fishing by 11:30. I helped Jane down the path to a spot near the river by the car, and then we walked down the road, and Jane snapped a few photos before I descended into the canyon to begin fishing. It was quite windy with intermittent clouds and sun. I walked a short stretch downstream to the point where the river spills over a cascade. 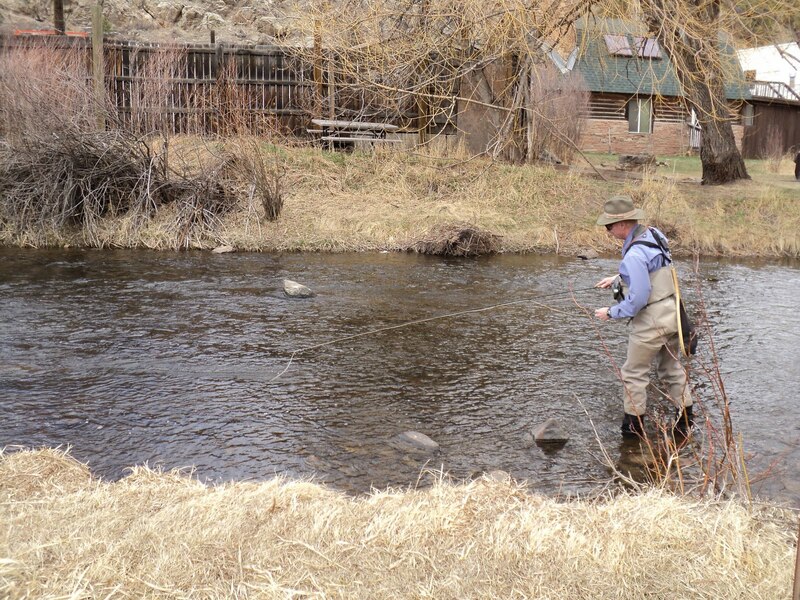 The water was higher than usual for this time of year, but clear and quite fishable. 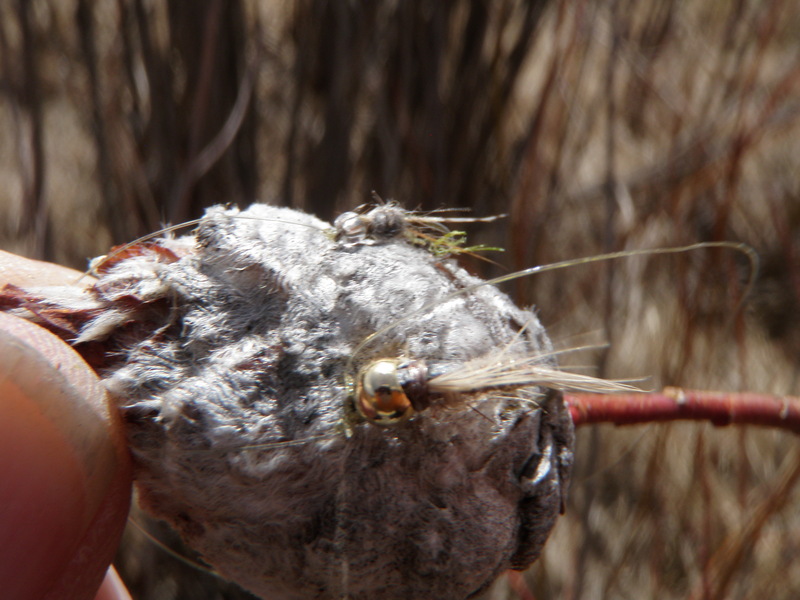 Because of the extra flows and the wind, I tied on a pink San Juan worm and trailed a beadhead hares ear. I worked all the likely spots on the roadside of the river, but had no success. When I reached a point perhaps half way to the bend below the parking lot, I crossed as the river fanned out and enabled a reasonably safe ford. I walked down to a point across from where I’d begun, and fished back up along the west bank, again with no success for my efforts. 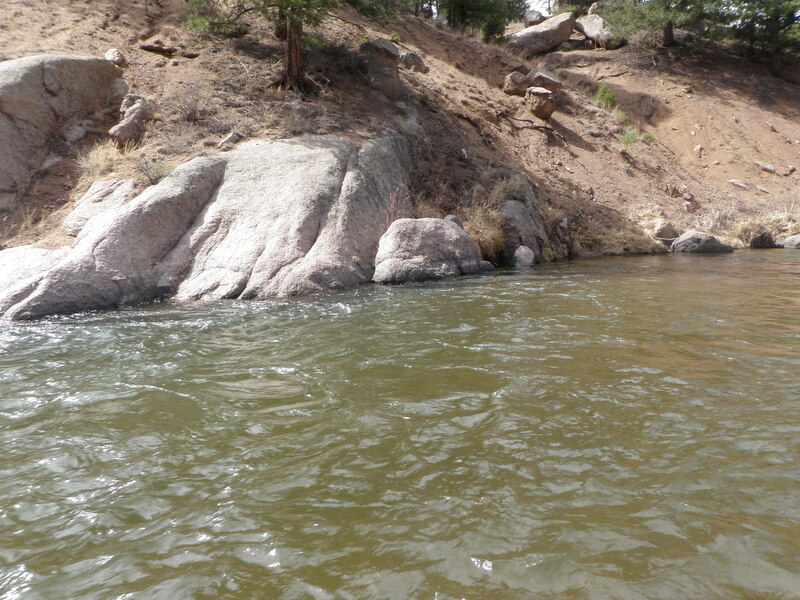 I crossed back at the same point and fished a nice juicy deep run midway to the bend pool. I clipped off the San Juan worm and tied on the hares ear as a top fly and the GO2 caddis on the bottom. Neither of these flies interested fish in the deep run, and I proceeded to the bend pool. Here I covered all the likely water and thought I spotted a rise in the V where the eddy swirled back along the main current. I also spotted what appeared to be two tiny BWO’s. I’d been fishing for an hour now, so I decided to return to the car, eat lunch and see how Jane was doing. Jane was seated in her chair by the river with her hood up and back toward the gusting wind. We loaded the car with her chair and my fishing gear and drove back up the road to the next parking lot, which I named Latino Landing. We ate our lunches in the car to remain sheltered from the wind. After lunch I hiked up the road, and Jane once again accompanied. 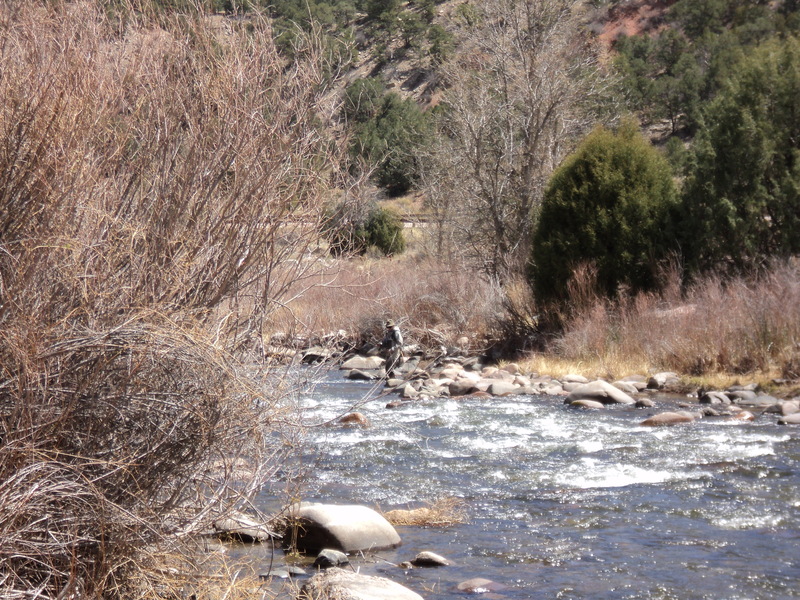 Unfortunately another fisherman had come down the road and was standing across from the boulder stretch that I love that harbors many brown trout. I elected to move above him, and dropped down the bank and began nymphing a nice long deep run that feeds into the pool/boulder area. I switched out the GO2 caddis for a beadhead RS2. I added a second split shot to account for the deeper water and higher velocity current. 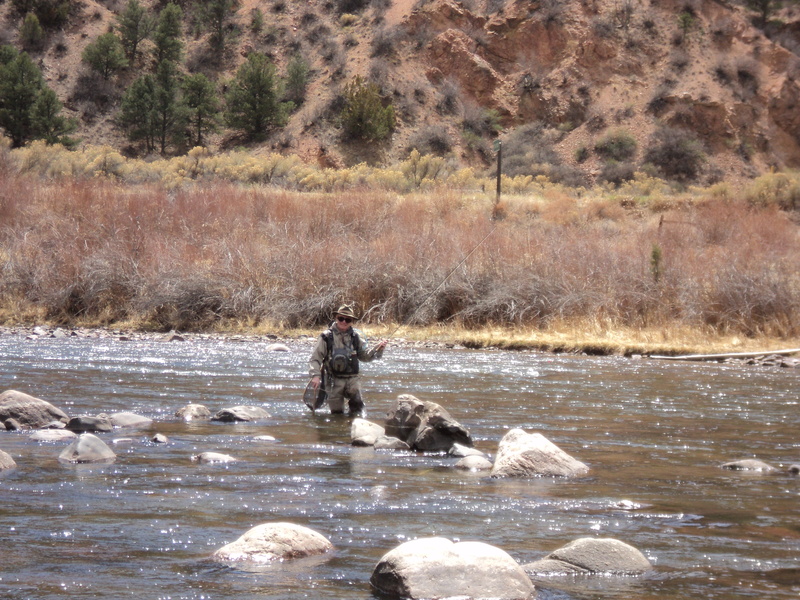 Once again I was disappointed and moved on upstream along the left bank fishing likely runs. The wind was really gusting by now, and I was forced to stop fishing from time to time to wait out the gusts. My last stop was the nice deep run and pool across from a vertical rock wall. I worked this water for ten minutes or so and decided the fishing wasn’t worth all the hassle and returned to the car. Jane was sitting in the car reading. We packed everything up and drove back to Denver.